Following the great American victory at the Battle of Saratoga in October 1777, Benjamin Franklin negotiated an alliance between the fledgling American nation and France. Motivated by a desire to weaken their British adversaries, and convinced that the Americans could not defeat the British with only foreign financial aid, in January 1780 France reversed its policy to not send ground troops to assist the Americans. In July 1780, General Jean Baptiste Donatien de Vimeur, comte de Rochambeau, arrived at Newport, Rhode Island, with and army of approximately 6,000 men. Two months later, Rochambeau traveled to Hartford to meet with Washington, who desperately wanted to French to aid him in his plan to assault New York City. However, even Washington was forced to admit that it was too late in the year to carry out such an operation. In May of 1781, the two generals met again, this time in Wethersfield. (Note: It was for these two meetings that Washington traveled through Litchfield County, likely crossing Bull’s Bridge in Kent, resting under the Washington Oak in Gaylordsville, and spending the night in Litchfield.) Here, they decided that Rochambeau would indeed move his army to Westchester County, to cooperate with Washington in an attack on the British garrison of New York City. The line of march would bring them across Connecticut, a route known today as the Washington-Rochambeau Revolutionary Route, administered by the National Park Service. Rochambeau’s forces began their march out of Rhode Island on June 18th. The general’s plan called for the men to march 12 to 15 miles a day. To avoid the heat of mid-day, the troops awoke at 2:00 am, and were on the march by 4:00 am. Marching was typically completed between 8:00 am and noon, at which time the men pitched their tents. The French army were treated as heroes by the Connecticut populace, who greeted them with music and dancing, and French soldiers long remembered the “beautiful maidens” they met on the march. Around June 30th, Rochambeau’s marched through Southbury, an event commemorated by the above marker. While this marker is situated between Route 6 and Mansion Hill Road, a National Park Service map indicates that Rochambeau’s forces did not take this route, instead picking up Route 6 further south. Jonathan Trumbull’s Surrender of Lord Cornwallis. Rochambeau is the 12th (final) figure on the left side. 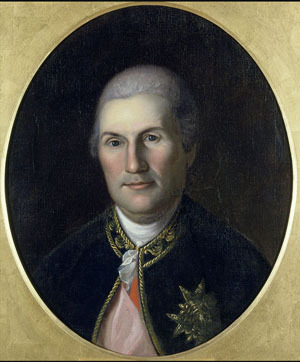 The British general Charles O’Hara, tasked by Cornwallis with surrendering the army, initially offered his sword to Rochambeau, who refused in deference to Washington. Washington also refused, and directed O’Hara to surrender his sword to Benjamin Lincoln (on the horse at center), who had previously been humiliated by the British at Charleston. Washington personally reviewed the French force after their arrival in Westchester on July 6th. After considerable discussion about how best to attack the British in New York City, the arrival of a French fleet off the Virginia coast compelled the two generals to change their plans and focus on the British force under Lord Cornwallis at Yorktown. Within a few months, Cornwallis had surrendered, the world was turned upside down, and the Americans were on their way to independence. It was thus a victorious French army that marched back through Southbury in 1782, having done much to ensure American independence.